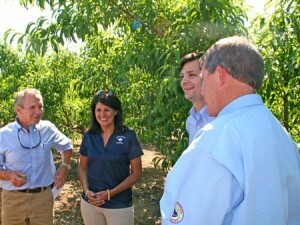 Following a visit to the packing plant and receipt of a description of plant operations by Josh Yonce the Governor returned to the first orchard for a press conference. Senator Shane Massey commented that it is important for people to know that the industry is open for business. “South Carolinians can help the peach farmers of our state overcome the loss caused by the weather by buying South Carolina certified fruit. Ask the store operators where the South Carolina Peaches are and tell them you prefer certified South Carolina fruit,” declared the Governor.